New to the charter market in the fall of 2014, I LOVE THIS BOAT is a stunning 145' Christensen accommodating 10 guests in 5 staterooms, including an on-deck master stateroom. She features an array of tenders and toys, including a 2017 28' Boston Whaler, an 18' Novurania, 2 waverunners, paddleboards, and kayaks for maximizing guests' time in the water. Well known for its tasteful art deco interior, the one-of-a-kind I LOVE THIS BOAT can accommodate 10 guests in 5 cabins. With features including backlighted glass, decorative rope lighting and shimmering overheads, her interior decor is certainly one of the more unique amongst yachts currently available for charter. The Master Stateroom is located forward on the main deck, with a private entrance that opens to an office. With neutral creme tones, the stateroom features a king size bed, huge walk in-in closet with washer/dryer, and a large vanity for the Mrs. The master head has a walkthrough shower with a most- inviting waterfall feature. Four guest cabins are located midship on the lower deck, and while stepping down the elegant staircase with soft plush carpeting, guests will have no problem finding their way to their staterooms with the backlit lighting and exciting artwork. 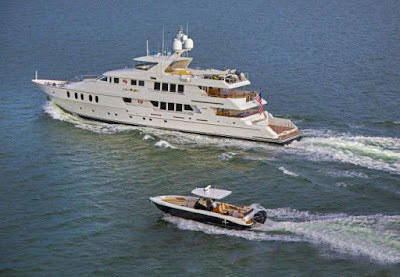 Standing in the guest foyer, the two queen cabins are located aft on the port and starboard sides, and are very spacious allowing for guests to fully walk around the beds. The heads are also large with plenty of counter space, a shower and toilet. The two twin guest cabins are forward of the queen cabins, and feature twin beds large enough for adults to sleep in. These cabins are also spacious and have an ensuite with ample counter space, large shower and toilet. I LOVE THIS BOAT is fully air conditioned through out.